As an nonprofit organization, we understand that getting involved in our community benefits all those involved. We strive to become an integral part of the lives of not only the children and families that we serve, but also our community as a whole. Below are just a few of our news items for you to view. Are you working in a North Carolina licensed child care facility unwilling to sponsor employees on a comprehensive T.E.A.C.H. scholarship? Help is still within reach! Please check out the Working Scholars scholarship. This scholarship is for use in the state of North Carolina only and should not be replicated. Starting in Fall 2018, UNC-Greensboro will be offering the brand new Leadership in Infant and Toddler Learning (LITL) Post-Baccalaureate Certificate Program. In support of this program, T.E.A.C.H. Early Childhood® North Carolina is now offering a new scholarship for those working with Infant and/or Toddler children and/or on behalf of their teachers. Charlotte Symphony Orchestra performed for about 80 families from Families First bilingual early childhood education programs in Cabarrus County in late April. The free concert was part of the symphony’s community outreach program and one of the first geared toward preschool children. Five new pre-schools in five years might appear a bit ambitious—and it is, Spencer Swain of Families First said. But when the mandate is help students pass kindergarten so they have a chance at a better life, no goal seems too lofty. Families First is a Cabarrus County nonprofit that seeks to educate the entire family. Through preschools, in-home visits, tutoring and adult classes, the organization focuses specifically on immigrant and Hispanic families, trying to set not only the children but the parents up for success long-term. Spencer Swain and his wife, Aurora, hope to take their mission to the next level and reach even more families. As part of that effort, they applied for the SEED20 in Charlotte last year, an event that chooses 20 area nonprofits to go through a training process. Ten finalists give a brief on-stage pitch to an audience, including a panel of judges, which awards first, second and third prize cash awards of up to $20,000. Though Families First didn’t win an official prize, the group did meet up with an investor interested in helping them meet the five-year plan. A presenting sponsor from the Foundation of the Carolinas Reemprise Fund approached Aurora Swain after her presentation for SEED20 last spring and scheduled a meeting to talk about her plans. Last year was a big one for a little bilingual preschool and family education nonprofit in Cabarrus County—little in size, at least, though not in mission. Families First has set big plans in motion, opening a second preschool over the summer and winning national awards to boot. Director of Operations and founder Aurora Swain recently earned the National Parent Educator of the Year for her efforts to reach the entire family in the population she serves. Earlier this year, Aurora Swain of Families First in Cabarrus County pitched her nonprofit’s innovative ideas to an audience of over 900 people during Social Venture Partners’ SEED20 OnStage. Aurora’s supporters filled up the front row of Knight Theater to cheer her on as she represented Families First and the families she helps every day. “I will never forget the first day when parents struggled to sign their names and even hold a pen,” Aurora said during her pitch. “You see, in Latin American countries education is not mandatory like in the USA. Obviously they couldn’t read or write. We resolved the problem by opening a school for adults, Monday – Saturday. I promise there is nothing more inspirational than this, seeing the power and freedom adults gain when learning how to read and write. We are educating the whole family. Aurora’s pitch helped Families First gain support from the Charlotte-based Reemprise Fund, who recently awarded the Cabarrus County nonprofit a grant in the amount of $25,125. The grant helped them hire a consultant with Amy Clinton & Associates to help them build capacity and remain organizationally stable in attaining their vision of 5 schools in 5 years. Families First, a direct service provider for the Cabarrus Partnership for Children, provides early childhood education and free parenting programs for parents who are struggling with parenting, poverty, addictions, and/or living linguistically isolated and their children. They operate an in-home visiting program utilizing the best practice Parents as Teachers model, the 5-star Cabarrus Bilingual Preschool, and support groups, with the goal of finding families who need assistance, give them a voice, and provide support to ensure success at home, school, and life. Much of childhood education hones in on developing the whole child. But at Families First, that emphasis envelops the entire family. “A lot of organizations focus on just the kids, which is great,” Aurora Swain, co-founder of Families First, said. “But if you don’t have the parents involved or you leave the parents behind, then you’re going to hit a wall. You’re going to hit a point where if my mom can’t help or my dad, who will? That innovative approach to preschool caught the attention of the SEED20 competition in Charlotte, a competition among nonprofits that are positively impacting their communities. And while Families First didn’t leave with the grand prize, the organization walked away with some great experience and exposure, to boot. One man helping change everything, all for his little girl. Click the image below to view the video of this amazing story. Families First, a bilingual preschool in Cabarrus County, is one of 10 finalists for the SEED20 OnStage competition, which gives out more than $45,000 in cash prizes. Aurora Swain, director of operations at Families First, will participate in an on-stage competition Monday, March 27, at the Belk Blumenthal Center in Charlotte where the 10 finalists present fast-paced three-minute pitches in front of a live audience. As part of our mission to better the lives of children in the community, we’ve teamed up with Families First in Cabarrus County, a local nonprofit organization serving at-risk children and families, to help provide children and their parents with needed resources they need to improve their lives both at home and in school. Founded in July, 2014 by Spencer and Aurora Swain, FFCC works to make a positive impact in the lives of Cabarrus County children by implementing three separate programs aimed at improving early childhood development. Programs include Parents as Teachers, Celebrating Families, and Cabarrus Bilingual Preschool, each one fully offered in both English and Spanish. Families First in Cabarrus County, a local nonprofit, is a finalist for Charlotte’s Seed20 award. Each year, Seed20 accepts a class of local nonprofits and hosts an educational evening where each nonprofit does a three-minute pitch. The organizations receive training, coaching, feedback and mentoring over the two months prior, working on effectively telling their story. Seed20 selects 10 nonprofits for the final pitch, and Families First was one of them. Rosita Rivera works third shift with a cleaning crew, and her shift runs from 1 a.m. to 6 a.m. But when her shift is finished, Rivera doesn’t race home to go to bed. Instead, she fights to stay awake so she can pick up her friends to head to class to learn English. Rivera moved from Guatemala to America in 1995 after her husband came here and over the years relied on her daughter to translate for her. Now, she wants to learn English herself rather than rely on a translator. She got her chance thanks to the Cabarrus Literacy Council. 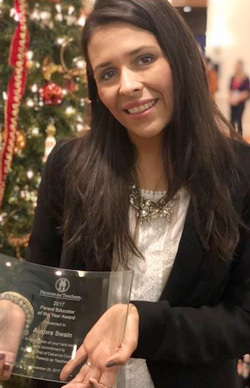 Rivera was among seven adult students involved in Cabarrus Literacy Council’s first group class for English as a Second Language, which was hosted at the Cabarrus Bilingual Preschool at 985 Central Dr NW, Concord. Cabarrus Bilingual School is a division of the Families First non-profit, developed by Aurora Swain and her husband, Spencer Swain, with their site used to host the group classes offered by Cabarrus Literacy Council.